Dominant doesn’t begin to describe International Falls’ 1962 state championship juggernaut. The Broncos boasted one of the state’s top defensemen in Don Milette, a senior who was their block of granite, as steady and reliable as they come. More eye-catching was the work of goaltender Mike “Lefty” Curran, a quick and agile puck-smothering machine who played his best when the pressure was most intense. What really made International Falls special that year was its top two forward lines and, more specifically, its knockout combination of centers. Keith “Huffer” Christiansen was a stick-waving magician. Undersized at 5-foot-5, he was an extraordinary playmaker who had fans holding their breath and defenders shaking in their skates every time he touched the puck. Jim Amidon was big and strong, a dominating presence who possessed a bottomless arsenal of skills. The 6-foot, 170-pound Amidon was gifted passer and goal scorer who also worked the corners and hustled back on defense. In 1962 the Broncos won their three state tournament games by a combined score of 13-2 to complete a 20-2-1 season. Amidon finished the tournament with two goals and four assists. Christiansen had two goals and two assists. In the championship game, Amidon (two assists) and Christiansen (one goal, one assist) each were standouts in International Falls’ 4-0 rout of a high-powered Roseau team that had won its previous five postseason games by a combined score of 39-5. Both Amidon and Christiansen were named to the all-tournament team. Curran said the Broncos’ top two lines faced their toughest competition in practice, when it wasn’t uncommon for sticks and elbows to raise and tempers to flare. “(International Falls coach Larry Ross) would put those lines out against one each and they would get their dander up pretty good,” Curran said. “They used the beat the hell out of each other. Amidon said the daily practice battles were as even as they were intense. 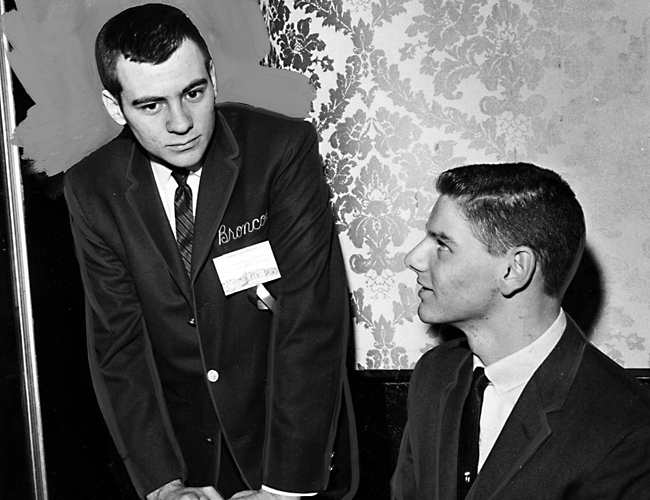 Amidon was a junior in 1962. The following season he would again lead the Broncos to the state title game. Only this time International Falls would lose 4-3 to St. Paul Johnson in overtime. Amidon’s goal with 42 seconds left in regulation forced the extra period. He had assisted on the Broncos’ two previous goals. The Broncos had not only lost stars Curran and Milette to graduation from the previous season. Glen Blumer, a high-scoring winger who played on Amidon’s line, also graduated. There were unexpected losses, too. Christiansen, who had transferred from Fort Frances, Ontario, as a sophomore, was ruled academically ineligible to play his senior season because he had repeated the ninth grade. 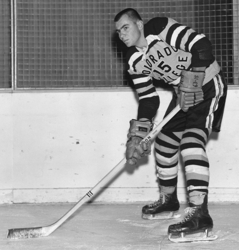 Bob O’Leary, another standout forward who excelled playing on a line with Christiansen, was ineligible his senior season because of a Minnesota State High School League rules violation. Despite the seemingly devastating drain of talent, and with Amidon serving as captain to a young group of future International Falls stars (Pete Fichuk, Gary Wood and Tim Sheehy among them), the Broncos went undefeated in 1962-63 before losing to the Governors. Amidon who led the state tournament in scoring with four goals and four assists, again was named to the all-tournament team. “It was pretty terrific, really,” Amidon said about growing up in hockey-crazed International Falls. “Hockey is like a scared thing almost up there. Amidon originally committed to play at the University of Minnesota but changed his mind and played for Colorado College instead. He played briefly for the Green Bay Bobcats of the USHL before serving in the military. He was a player-coach for a team in France before retiring from pro hockey. Amidon, a retired elementary school teacher, lives in Bozeman, Mont.